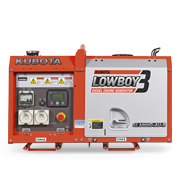 Get back-up power fast – Kubota’s GL ‘Lowboy’ series II has your back when unexpected power outages hit or your off-grid solar system lets you down. Built to withstand Australia’s tough conditions, they also feature reduced emissions and environmental impact, so you can do your bit for the planet without it costing you the earth. 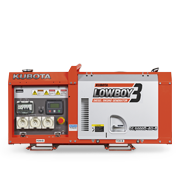 The GL Lowboy diesel generators offers easy single side maintenance, a compact design and lower noise levels that make it perfect for a wide range of residential and commercial applications. You’ll also enjoy exceptional fuel economy combined with Kubota Diesel Generators’ large fuel tanks to extend operating periods between refuelling.